Numerous Indianapolis cosmetic surgery patients have visited Dr. Barry L. Eppley for help in surgically reducing the appearance of their scars. Dr. Eppley encourages patients to read the accompanying literature and visit the scar revision treatment photos page to learn more about the different treatment options. Any interruption of the skin, whether from an accidental injury or from the surgeon’s knife prompts the complicated process of healing, the end result of which is a scar. The word “scar”, however, often invokes the image of an unwanted deviation of the healing process, a physical derangement from the smooth and non-discolored appearance of skin that it replaces. The most recognized impact of most scars is the accompanying negative psychological burden that it conveys. Unfortunately, many have profited from exploiting this psychosocial angst by marketing false hope in the form of bogus potions and concoctions that have no real benefit on improving the appearance of scars. Effective scar treatments should be influenced by evidence-based medicine and valid scientific research. The use of the term ‘scar removal’ is both misleading and a misnomer. Only in rare instances and with very superficial scars can they truly be removed and made to disappear. The reality is that many scars, but not all, can be reduced in visibility and made to look less obvious but they can not be made to go completely away. 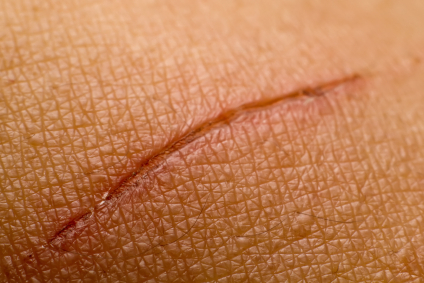 One of the most common causes of scars is the result of lacerations and traumatic injuries. No matter how well, by whom, or in what environment (emergency room vs. operating room) a laceration may have been repaired, undesirable scars are a frequent problem. This is undoubtedly due to the influence of crushing/tearing forces on human tissue from traumatic injuries, a far cry from the controlled and gentler cutting of a scalpel during surgery. As such, the origin of the injury has much to do with the resultant scars. Different types of scars respond to different types of treatments, albeit surgical, laser or topical therapies. Determining a scar’s type is important before deciding on a specific scar therapy. Hypertrophic scars are raised, firm, red and inflamed-appearing scars. The extent of the scar remains within the boundaries of the original skin injury. With time, the raised and red portion of the hypertrophic scar may regress over time. This type of scar is often confused as being a keloid, which is quite different. Scars also often become wide and more noticeable when they cross the relaxed skin tension lines (RSTL) on the face or the body. Atrophic scars are skin depressions most commonly caused by the destruction of collagen, a primary skin component that gives skin its elasticity and firmness, during inflammatory skin reactions like chickenpox, trauma, or surgery. 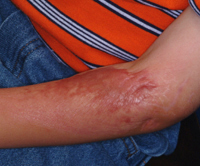 These pitted or indented scars make the skin appear much thinner and often red due to its thinness and small vascular telangectasias in them. Trying to apply makeup to conceal the lesions can actually worsen the skin’s appearance as makeup enhances the textural variations. Keloids are also raised, reddish-purple, nodular scars that are usually firmer than hypertrophic scars. They extend beyond the boundaries of the original injury site, encroaching onto surrounding uninvolved healthy skin. Keloids often result from seemingly innocuous injuries, such as ear piercing and tattoos. Unlike hypertrophic scars, keloids do not regress over time. Slow growth can continue to occur, years after the original injury. 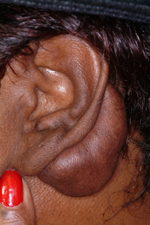 And while keloids can occur in all skin types, they are generally more common in darker skin. 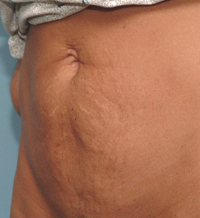 Striae (stretch marks) are linear bands of wrinkled skin that most frequently result from rapid weight loss or weight gain, pregnancy, and tend to appear in areas like the stomach, breasts, thighs, hips, and buttocks. Initially, they tend to be red, then become purple or white and are the result of overextension and linear thinning of the skin. Acne scars can be classified into 3 types: icepick, rolling, and boxcar scars. Icepick scars are narrow, sharply demarcated tracts that are wider at the surface and taper as they extend through the skin. Rolling scars tend to be more superficial, wider, and produce an uneven appearance in the skin. Boxcar scars tend to be round- to oval-shaped skin dimples with sharp margins and are also wider than icepick scars but they do not taper. Most tend to have diameters from 1 to 4 mms. Burn scars are a very unique type of scar because the skin has become severely damaged and they are usually very broad in surface area. They create an unnatural smooth and shiny appearance to the skin and are usually raised or thicker than the surrounding normal skin. The entire burn scar is really a collection of thick dense scar that has a poor remodeling ability and is very resistant to change due to the severe fibrosis. Of critical interest to patients is when they can have their scars revised. There are many factors that determine the timing of scar revision including the scar appearance and the amount of time from the original injury. The standard answer is to wait at least 6 months and as long as a year. This gives the scar plenty of time to heal and mature and the effects of any topical scar therapy to be realized. Biologically, scars continue to heal and remodel up to a year or longer after the injury. The final appearance of a scar can best be assessed after this period of remodeling and collagen reorganization as the redness of the scar has faded. For this reason, scars that initially appear red and raised can improve dramatically over a year if they lay very favorably to the relaxed skin tension lines and are not under a lot of tension. But many scars show early signs of being unfavorable due to width, location, edge step-offs and shape and length of the scar. Thus, performing scar revisions can be done as early as 2 months following the injury if its feature indicate that time and scar remodeling will not make a big improvement in its appearance. 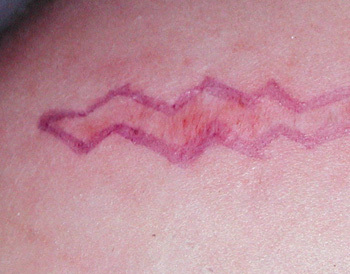 Scars are magnified in visibility by four main causes; they are too wide, they have surface irregularities (scar level above or below the surrounding skin level), they have unnatural color to the surrounding skin (brown pigment, white scar, or red due to small blood vessels), or they lie unnaturally against the relaxed skin tension lines. Most scars have one or more of these problems. As a result of the different reasons for prominent scarring, surgical scar revision is really the use of a variety of different surgical techniques to address the specific components of the scar problem. There is no one universal surgical scar revision technique. 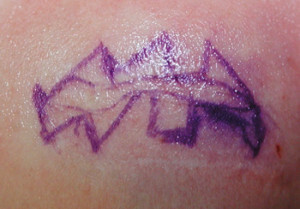 Scar revision techniques consist of either simple excision and reclosure or some form of geometric rearrangement. These scar revision techniques are primarily based on changing the orientation and shape of the scar through an angular geometry approach. Scar revision techniques have a long history in plastic surgery and are used as much today as they were many decades ago. 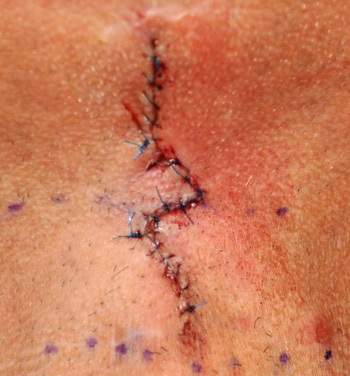 While many patients think of scar revision as being done with a laser, like a magic eraser, the reality is that surgical excision and rearrangement of adjacent tissues is often more effective and is the backbone of most scar revision approaches. Such scar revision techniques often have names that visually describe how the scarred tissues are rearranged. One of the most well known plastic surgery scar revision methods is the Z-plasty. Geometrically the Z-plasty is a transposition flap technique that allows two adjacent undermined triangular-shaped skin flaps along the same axis to be switched in position and lie at right angles to each other. What a Z-plasty does best is to break up a straight scar line and reorient part of it so that it lies parallel to more favorable relaxed skin tension lines. (RSTLs) By so doing, the scar may be harder to eventually see (not a straight line) and less prone to recurrent scar band contracture/tightening. It does at the expense of actually making the total scar length longer, which may be especially helpful across moveable body surface areas such as joints and bony prominences. The Z-plasty is done in a variety of ways including the classic technique as well as multiple and adjunct z-plasty methods. The Z-plasty was originally described as being made up of three limbs, a central and two parallel side limbs with varying degrees of angulation (30 to 75 degrees, 60 degree most common) to the central axis. This angulation from the central axis affects how much scar lengthening is achieved. 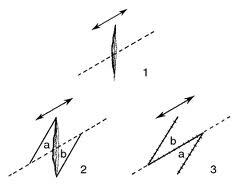 A 60 degree angulation creates a 75% scar length increase. 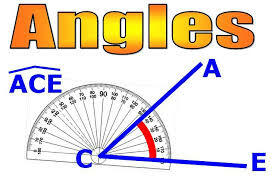 Conversely, for example, a 30 degree angle results in only a 25% scar length increase. The W-plasty (also termed the running W-plasty or zig-zag plasty) changes a straight line or linear scar into one that is irregular. Visually it creates a ‘pinking shear’ effect to the scar. On the surface this approach to scar revision seems counterintuitive but it based on the fact that it is harder for the eye to follow an irregular line than a perfectly straight one. For example the w-plasty is very effective in revision of semicircular scars in which the unbroken curved scar is noticeable and prone to a pincushioning effect as the scar contracts with healing. It is also helpful to make a scar look better to the relaxed skin tension lines. 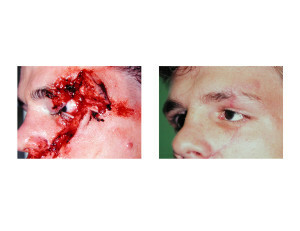 The W-plasty scar revision consists of creating consecutive small triangular flaps on opposite sides of the scar with the sides not more than about 6 mm and corner angles of 90° or less. 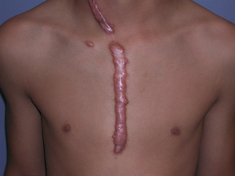 Since this scar revision technique does not use the transposition or rotation of skin flaps, the final length of the scar is not increased. 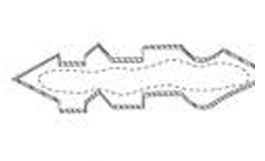 A close cousin to the W-plasty, the geometric broken line closure (GBLC) shares the concept of creating the illusion of less visibility by making the scar line irregular. But the GBLC usually offers better results because it is even more irregular in its pattern and thus even harder for the eye to follow. It also does not transpose skin flaps and thus does not elongate the scar. GBLC scar revsion is done by creating an exacting pattern of irregular geometric shapes on either side of the wound that are usually less than 6mms. These could be triangles, squares or rectangles that when brought together fit into their opposite margin counterparts. The geometric shapes are randomized along the length of the scar with different heights of them along the way. The chosen patterns are up to the imagination of the plastic surgeon to create. Lasers are often thought of as a magical treatment for scars, like an eraser. But nothing can be further from the truth. They can be a helpful aid in scar treatment and they have a useful role but it is often overstated as to their actual value in scar reduction. Lasers are best used in scars that have a mild surface contour irregularity like atrophic and hypertrophic scars and for scars that have a persistent redness to them. Smoothing of atrophic facial scars with carbon dioxide (CO2) and erbium:yag ( Er:YAG) laser vaporization has become popular in recent years. Through selective ablation of water-containing tissue, both laser systems offer predictable reproducible vaporization of tissue, resulting in better control compared to dermabrasion. Their effects are directed to ‘resurfacing’ the edges of the scars in an effort to either decrease the topographic differences between the level of the scar and the surrounding normal skin. (either lower the surrounding rim of normal skin or lower the raised scar portion) Whether laser resurfacing will be beneficial depends upon how discrepant the differences are between the scar and the surrounding skin. As a general rule, differences of up to 1mm can be treated with visible signs of improvement. 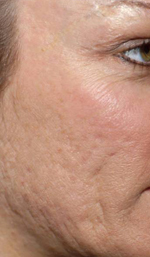 CO2 laser resurfacing is more powerful but results in greater tissue removal and longer recovery periods. Er:Yag laser resurfacing has become more popular today due less recovery but it also creates less of an improvement per single treatment and usually requires a series of laser resurfacing treatments to see its best scar benefits. Regardless of which laser type is used, treated skin appears red and swollen immediately after laser treatment. Redness is most intense and prolonged after CO2 laser resurfacing (2 to 3 month average) versus Er:YAG laser treatment which results in redness for 1 to 2 weeks postoperatively. For Er:YAG laser resurfacing, the formation of new skin typically takes 4-7 days, whereas CO2 laser resurfacing requires 7-10 days. The newest innovation for carbon dioxide laser resurfacing is the concept of fractional or fractionated laser resurfacing, which has great value in laser scar treatments. A traditional carbon dioxide laser treatment is known as ablative where the entire surface of the scar is treated. Conversely, a fractional laser only treats a portion of the scar’s surface (up to 22%) by making channels into it. These channels go deeper into the scar which helps stimulate collagen formation. But by leaving a larger portion of the scar untreated, the healing and recovery is much quicker. In addition, it is far safer (less risk of hypo pigmentation) for treating more pigmented skin types because it leaves a larger portion of uninjured skin and its melanocytes behind. Fractional laser resurfacing is particularly good for treating acne scars and in the early treatment of traumatic and surgical incisional scars. Pulsed dye laser (PDL) therapy is directed towards the treatment of the vascular component (redness) of a scar. It may also have some effect on the collagen component (thickness) of scars, softening iIt earlier in the healing process. With dual effects on scar tissue, PDL treatment hastens the maturation process and enables scars to be less noticeable sooner. PDL has its best benefits in the early treatment scars (first few months after their occurrence) or in the later of scars that remain persistently red and have not faded. Evaluation of the scar will determine whether scar revision may be helpful and what technique is most likely to be beneficial. The biggest decision to make is about when to do scar revision. The traditional approach is to wait until a scar is mature (redness has faded) to see how well it blends into the surrounding skin. This is usually about one year in adults and longer in children. 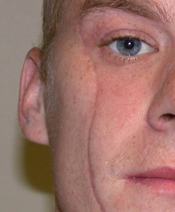 However, certain undesirable features of a scar may not change, regardless of time, such as excessive width, depression of the scar, or the way it crosses natural skin lines. 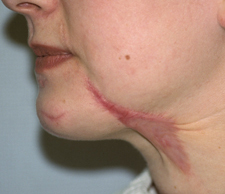 In these cases, scar revision may and should be done earlier. Scar revision may be done under either local anesthesia, IV sedation, or general anesthesia dependent upon the location and size of the scar. This would almost always be done as an outpatient unless it is part of an overall larger operation. The majority of scar revisions involve cutting out the old scar and reclosing the area with unscarred tissue, often altering the straightness of the scar line. Light smoothing of the scar is done with laser resurfacing. Deep smoothing is done with dermabrasion. Dressings are either antibiotic ointment along or surgical tapes. Sutures may be under the skin which don’t require removal or, if above the skin, are taken out in 5 to 7 days. Once the sutures are removed, tapes may be applied for an additional several weeks to support the closure. In most scar revisions, longer-term topical therapy should be started by three weeks after surgery and continued for three months. A topical scar modeling ointment is my preferred choice at this time.